Description: A wild guess is that the 2226 is in for some new wheels at the Interbay Roundhouse shops. Description: BN 134 with a trio of GP30s entering the Samish Tunnel. Description: Local power at rest at Bellingham. Description: Did I say I like GP30's? Description: Bellingham House track full of GP30s. 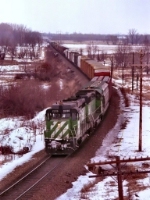 Description: Northbound train 141 or 835 crossing the now abandoned ex-GN bridge at Boylston, WI with an ex-CBQ GP-30 on the point. The BNSF now uses the ex-Soo Line Danbury Sub bridges to cross this river just to the east of here. Description: an old CBQ veteran GP30 leading a train northbound, has just left the Nemadji River bridge and in about 1/4 mile will leave the Hinckley sub for the last part of the trip to Superior yard. Description: This former CB&Q GP 30 was on a transfer run out of Northtown. It is passing under the Soo Line main.